The state Legislature ends tomorrow with the expected passage of the first major tax cut since former Gov. Ben Cayetano's reductions in 1998, but a major Washington think tank says it isn't enough. The Center on Budget and Policy Priorities yesterday issued an analysis of the $50 million income tax cut, saying Hawaii taxes the working poor more than almost every other state. »Pending: House and Senate expected to pass $50 million in tax cuts tomorrow. »Pending: Suspension of the wholesale gas-cap law passed the Senate last night and is expected to pass the House tomorrow. »Pending: Ban on smoking in enclosed public places passed the Senate yesterday and will be voted on in the House tomorrow. »Passed: A proposal that would halt the planned redevelopment of state land at Kewalo basin and Kakaako. »Passed: A measure requiring a sentence of 30 years to life for third-time violent felony offenders. »Failed: Bill to allow corporations to give unlimited contributions to political action committees. »Failed: Proposal to impose stiff penalties on drivers who fail to yield to pedestrians in crosswalks. "Hawaii is one of the very worst states in the treatment of working poor," said Jason Levitis, the center's policy analyst and counsel for the state fiscal project. The tax bill changes, Levitis said, will take Hawaii from being the second worst to the fifth worst in terms of taxing the working poor. "The poorest 40 percent of Hawaii residents, those with incomes under $31,000, would receive only 20 percent of the benefits of the tax-cut bill," Levitis said. The other 80 percent of the bill's benefits go to the middle and upper economic brackets, Levitis said, in one of the first independent reviews of the new tax proposal. Republican Sen. Sam Slom agreed, saying: "We haven't given real tax relief to the people of Hawaii." Sen. Brian Taniguchi, Ways and Means Committee chairman, defended the tax bill, explaining that the reduction in the standard deduction to 40 percent of the federal deduction "was a start." "The problem is that the standard deduction is something that you can't take away, so we are moving it slowly. We are being cautious," said Taniguchi (D, Moiliili-Manoa). In other tax action, a bill that would raise the tax on a package of cigarettes by $1.20 in six years has cleared the Senate and is expected to pass the House. Yesterday, the Legislature's penultimate day of action, saw both chambers working from morning to evening, with the major action being the passage of a $4.7 billion supplemental state budget that was increased by 4.9 percent. "Our challenge was to strike a balance between providing for the numerous unmet needs in our communities caused by tight budgeting and ensuring a prosperous future for state," said Rep. Dwight Takamine (D, Hawi-Hilo), Finance Committee chairman. "You challenged us, Mr. Speaker, to reinvent our future. We did just that," Takamine added, addressing House Speaker Calvin Say (D, St. Louis Heights-Kaimuki). Included in the Legislature's spending plan was $60 million in disaster relief for repairs to public buildings and roads. Also included was a one-time state income tax credit for victims of the 2004 Manoa flood and the March rains that caused statewide flooding. The tax credit will cover up to 10 percent of losses not covered by insurance, up to $10,000. Yesterday's action also included a bill that would essentially cancel the state's gas-cap law that went into effect last summer. "My constituents want a repeal of this gas cap," Sen. Bob Hogue (R, Kaneohe-Kailua) said during a floor speech. "It is not working and they want an end to the confusion." An attempt was made to amend the gas-cap law, but the bill passed the Senate yesterday and is expected to pass the House tomorrow. It would suspend the cap unless the governor reinstates it. The Legislature also approved a bill that is expected to halt the planned redevelopment of state land at Kewalo basin and Kakaako. The Hawaii Community Development Authority had planned a revamping of the waterfront area, including several condominium projects. Critics said the project would sell off valuable state land and drive residents away from the area. Gov. Linda Lingle suffered a series of defeats yesterday as several nominees were rejected in the Senate. Sen. Donna Kim (D, Kalihi Valley-Halawa) said Charles Sted, chairman of the Housing and Community Development Corporation of Hawaii, had been unresponsive to her requests for action in improving public housing projects. She led a successful campaign to reject his re-appointment. The Senate is expected tomorrow to vote down the nomination of Alma Caberto to the Land Use Commission and Frank De Luz to the Board of Land and Natural Resources. Both were rejected by the Water, Land and Agriculture Committee. Committee Chairman Russell Kokubun (D, Hilo-Naalehu) said De Luz "did not have an understanding of land use and natural resource issues and inadequately failed to identify potential conflicts of interest." The Sierra Club had campaigned against his nomination, saying he had been fined for illegally cutting trees on his Hilo property. In the case of Caberto, Kokubun said she did not have an understanding of the post. "Your committee finds that the nominee did not have an understanding of general land-use topics or knowledge of the Land Use Commission's functions," the Water, Land and Agriculture Committee said in a report. 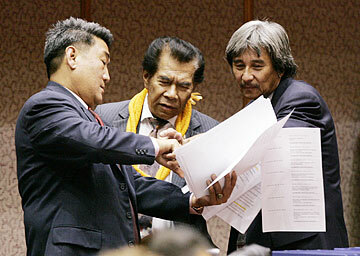 State Reps. Michael Magaoay, left, Ezra Kanoho and Michael Kahikina discussed a bill during a recess last night. » S.B. 995: Proposed constitutional amendment to remove the mandatory retirement age of 70 for state judges. » H.B. 1917:Proposed constitutional amendment to create a commission to set salaries for the governor, lieutenant governor, legislators, state judges and state department heads. » H.B. 1918: Establishes the salary commission upon ratification of proposed constitutional amendment. » S.B. 2004: Creates the Ahu o Laka state monument at the sandbar in Kaneohe Bay and allows the Department of Land and Natural Resources to regulate the area. » S.B. 3076: Designates the coqui frog as a state pest. » S.B. 2941: People convicted of setting a brush fire may be required to pay the costs of fighting the fire. Parents or guardians of minors would also be liable for brush fire damage attributable to that minor. » S.B. 2260: So-called "three strikes" mandatory sentencing of 30 years to life in prison for repeat violent felons who commit three of the following crimes: murder, manslaughter, continuous sexual assault of a minor, robbery, kidnapping and burglary. » H.B. 862: Establishes the offense of excessive speeding, which is defined as driving 30 mph or more over the speed limit or 80 mph or more. » H.B. 3121: Sets up process to establish emergency shelters for pets. » H.B. 2555:Stops residential development in Kakaako makai. » H.B. 2146: Allows agricultural lands used for certain activities to be subdivided and leased without having to follow county subdivision ordinances. » S.B. 2065: Unpaid parking fines and judgments shall not prevent the transfer of a vehicle's registration and title by the registered owner. » S.B. 2159: Increases penalties for identify theft. » S.B. 2090:Requires the Hawaii Community Development Authority provide more public notice for its public hearings and notify the Legislature of public hearings. » S.B. 439:Gives the state Ethics Commission the power to impose administrative fines up to $500. » S.B. 2570: Increases state tax credits for the motion picture and film industry. » H.B. 2239: Acquisition of Kukui Gardens property. » H.B. 2500: Increase the Judiciary budget by $6 million to allow for the purchase of Kapolei land for a new courthouse. » S.B. 965:Changing state wiretap law to allow use of federal wiretap information in state prosecutions.